Navigate the world by changing the light colors, opening new paths, making sweet trick jumps, flippin' switches, and finally escaping this kaleidoscopic, mind bending world! Tip: You don't have to click directly on the lever to switch them, your character just has to be touching them when you click! Phew! This was my first game jam, and it was a blast! A lot of work, but tons of fun! And a great learning experience too. I hope you all enjoy the game. Early feedback suggests the difficulty ramps up a bit too quickly -- Sorry about that! My best tip is to go slow, analyze the colors of the blocks carefully and predict how they will change before you make a move! Special thanks to my wife for running around our house in the last few hours, recording various clicks of light switches, grinding sounds, and door rattles! The game would have no sounds without her! Super cool game! Puzzles were challenging but not unfair, quite clever, actually. As a graphics designer I loved the implementation of magenta etc. Pretty unreal experience, but I liked it very much! Hey! Thank you for playing and for the kinds words. I'm glad you found it fair (though I imagine a 'but unforgiving' wouldn't go amiss after that statement). It's really gratifying when you hear that someone enjoyed your game. Thank you! Well I am just going to say it... too tough for me =D Which is not a criticism at all. I think you nailed the theme integration. I had a hard time keeping all of the controls and keys straight. I really liked how you wrote the tutorial / instructions on the wall to introduce things as you played. One suggestion would be to remove the death element and just block progression based on the puzzles. That would ease back the difficulty a bit. Thought it was a very cool prototype, well done! Thank you for the feedback! It definitely turned out tougher than I intended, and remapping the controls was desperately needed! If I were to go back, I think I'd add checkpoints throughout the level so that death wasn't quite so punishing. Thank you for taking the time to play and write your thoughts! Great game and thanks for participating! Thank you for playing Peter! I learned a lot about what the game could do better while watching you play. The theme integration for this game is insane. I'm going to echo a few others by saying this couldn't exist without the colors. And it was a really smart idea to go with additive colors light. Few people work with that color schema where as we're all taught pigment color addition from an early age. It fits the theme well of turning on switches. Smart. Smart. Smart. I do echo Bird and Kwis' concerns over the difficulty. They already mention a slower start to get the hang of things, but I also wonder, what if the pallette was with pigment colors instead? Yes, that doesn't fit as well with the light switch motif, but I wonder; would that have changed the difficulty curve because combining pigments is a more learned concept for us? This is just an inconsequential wonder. Another wonder I have about the difficulty as I write this feedback, watching the game's GIF in the corner of my screen: Why didn't I get to play that room? That looks like a great level to introduce movement and switch work without needing to use text to explain the game. I want to play that level. You know what really messed me up though in difficulty? Your hints. I didn't understand what the Q+Space was hinting at nor the comment of how two switches make things work differently (at the time). Maybe the level was too big for me to actually understand what was being referenced, but I definitely feel like relying on the text to explain your game let you take shortcuts in the level design which led to the almost unfair difficulty curve. I can see what you mean about using the text as a kind of crutch. I don't know if I could get away with zero text in a fully polished version of this game, but it would ideally be a lot less. The Q+Spacebar tip was thrown in to the final level in the last few minutes, because I knew that that was a particularly tricky part, and instead of trying to fix the level, I just added the hint. The only excuse I can give to the difficulty curve and the reliance on text tips, is that I only spent maybe the last seven or eight hours of the last day on levels. And I was unfortunately too focused on exploring how many new ways I could put the elements together, rather than considering the player experience and the difficulty curve -- a big regret! I really appreciate your feedback, criticism, and very kind words. I'm grateful to have someone take the trouble to play my game and give such thoughtful feedback. Thank you! Gonna join Bird's feedback here. I am personally NOT into/fond of these type of "smart" puzzle game, as I'm a rather intuitive kind of person, so an action twist to a puzzle is very hard to approach for me. As Bird mentioned, it would have helped to have a slower start considering difficulty, as even the first level forced you to correctly anticipate the colors. I didn't get the time to be familiar with the colors and it already asks many things, and falling makes you start over. A nice start would have been with fewer colors, as it would allow you to get used to the most basic color mixing for the light magic. Aside that and my natural frustration, it was super interesting. Also, the graphics are minimalist, but it works very well with that type of idea and the more simple it is, the better. I think it might not have worked with other type of visuals, although I still find that one too simple. But what matters is the functional part, and you got that super right, so it's fine. I really appreciate your feedback! Thank you for the time and effort you put into playing and critiquing, despite the frustrations it caused! The is really clever and fits the theme perfectly, it's not a game shoe horned to use colors, it's a game about colors and mixing them, with out colors this wouldn't work, but a lot of the submissions i've played the game works fine without the color aspect, so you've hit the nail on the head theme wise. There isn't much sounds and no music (same as my game really) and I know that would have benefited our games more. So I'll try take my own advice haha. Although I had a pretty frustrating time with this game, so far its one of the most creative and fitting to the theme submissions I've played so far! I found the game a bit unintuitive to play, which might have been caused by the games steep learning curve. The flashlight mechanic was definitely a really interesting way of showing the player what hides within the other perspectives, but I felt I couldn't play it well since I didn't know much about how these colors worked together, and it turned into a bit of a guessing game much farther down the line. If there was more of an introduction to how these other colors worked, and maybe a few simpler levels, I might have been able to see it through! The colors constantly changing were also fairly jarring to my eyes, which made it a bit difficult to keep going. 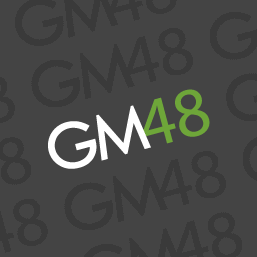 Despite these complaints, I still think this is a really solid submission for GM48, and its one of the few games that has stayed true to the theme in a pretty creative way. It might not be my thing, but I can imagine this kind of game would be a lot of fun to the right person! The game absolutely needed to slow down and ease the player into the concepts, and I really wish I had included a diagram in the HUD that was similar to the image I added to the description. I think that would've been really helpful. There's sooo much I would / will change in these regards, if I work on it post-jam. And this feedback really helps. Given how the difficulty curve ramps up like a brick wall, I really appreciate you taking the time to play it and provide your perspective! It's probably not for everyone, but it's really good to hear a variety of views, so thank you so much! I really appreciate you giving it try! I do wish I could go back and tone the difficulty down a bit. It's the biggest flaw (among many) with this entry. Thank you for spending the extra time for feedback! I really love this game! For starters, it has a lot of personality, and teaches you the mechanics and points you in the right direction with a fun voice. The theme of the jam is incorporated perfectly, where the game forces you to learn and think about adding colors and what you will get if you change your current color. It's difficult to wrap your head around it at the beginning and I ended up overthinking every step, but in a good way. I adore this puzzle aspect and thought it was really fun, which is why I didn't really enjoy the more punishing platform-y bits, considering the character doesn't control super well and is really slippery. Still, I managed to get to the end, and I loved the puzzles, and the way you had all the information available before you did anything. It made it fair when you lost because you made a mistake. Lyra, thank you so much for your kind words! In retrospect, I do wish the difficulty curve was gentler, and maybe added a bonus hard level that wasn't required. The character is a little slippery and I regret that a bit as well. It might have been better to focus more on the colory-puzzley aspects and kept the platforming pretty basic. I really appreciate your feedback and I'm glad that you enjoyed it! Thank you for sticking with it to the end! Nice puzzle platformer. It really made me think and forced me to look at problems from a different angle. I like how the characters eyes follow the mouse. You've managed to breathe life into a square. Very enjoyable entry! Thank you for taking the time to play and give feedback! Glad you enjoyed it! This puzzle was quite challenging for me and taught me a lot about additive colors! I like the cute sound effects. Some background music would be nice. Thank you for the feedback! Music would be a definite improvement! This is one of the most true-to-theme games I've played from the jam so far, and it's very well done. The platforming feels responsive and sharp, and the puzzles are quite difficult. The only critique I have is that the character feels very rigid, and I'd like to see a little squash and stretch in the animation, but that's personal preference. Thank you for taking the time for feedback and the wonderful compliments! I agree 100% with the comment about the character, I wanted to add some kind of juice like that, but the time constraints won out here, sadly. Ha! I love this. Thank you so much Joe! This game probably fits the theme best out of any game I've seen so far. The controls are pretty hard to get used to though, and the puzzles are demanding. I think it would have been a better experience if the puzzles started out easier. One suggestion I have is that the game should slow down slightly when switching colors so you can make jumps more easily. Despite the few problems, this game is really good overall. Thanks so much! I definitely wanted to have remappable controls! I had most of the code in place to support it, but didn't have time to make a UI! The difficulty curve is a definite problem! I was so busy figuring out what was possible that I didn't stop to consider this aspect! I really like the time slow down idea! If I do any post jam work, I may play around with this idea! Thanks for taking the time to play and for the feedback! Fun little game. The puzzles are pretty clever and it's an amazing use of the theme. Hope you enjoyed it! Thank you for giving it a try and for the feedback! Navigate the world by changing the colors, opening new paths, flippin' switches, and escaping this kaleidoscopic fun house! Proud Papa of two. Code monkey by day, gamer and hopeless dreamer of being a game developer by night. Cannot art to save his life, so all his solo projects are made of squares.